Ironically, for all those proclaiming Unbreakable an unvarnished classic, the precipitous box office drop off of that movie experienced, following the anticipation The Sixth Sense had instilled, looks to be repeated here in a somewhat lesser capacity, the success of Split and promise of a surprise trilogy capper undermined by it notbeing the sort-of sequel and trilogy capper audiences believed they’d been promised. I wasn’t fully on board with Split; Shyamalan as director was firing on all cylinders, James McAvoy revelled in his multiple roles, and Anya Taylor-Joy delivered a performance possibly too sensitive for the material, as that material was a dubious blend of schlocky and serious that felt exploitative when dealing with the crucial child abuse element. I wrote in my review that I suspected Taylor-Joy’s Casey would be underserved by the sequel, and it would further underscore denying her a fully cathartic ending in Split. That’s confirmed here, with Casey very much on the periphery (identified with other satellites to the superheroes/villains). There are a couple of interesting scenes as she draws on her sensitivity and connection with Kevin – able to identify with the victim rather than the aggressor(s) – to break down the resistance of his other personalities, but if Shyamalan was really interested in her agency he wouldn’t have brought Bruce and Sam into the scenario at all (although, if there’s a lesson to take from Glass, it’s that such agency would likely leave her dead). Having done so, though, what to make of Shyamalan’s meshing of material? Or should that be re-embroidering, as he has stated Kevin was originally part of a much larger version of Unbreakable that needed paring down? McAvoy is as committed to the part as before, with added bounding around in daylight as a slightly silly-looking version of already silly-looking X-Men Origins: Wolverine’s Sabretooth, but the performance is now effectively a parlour trick, divested of the fear factor frisson it carried first time round. It’s Anthony Hopkins trotting out Lecter for the umpteenth time, purely to revel in the ham. There’s a lot of fun to be had from McAvoy, as he fills the screen equally and oppositely to his co-stars’ (mostly) underplaying. But there’s also the way his in-camera transitions between characters take on the slightly stilted manner of an impressionist switching personas mid-routine, right down to having to say who they are now. To an extent, though, the performing seal aspect of Kevin in Glass, and more especially The Beast, is a purposeful function of Shyamalan’s setup, designed to put the three pro/antagonists at the mercy of Sarah Paulson’s Dr Ellie Staple. Anyone familiar with Shyamalan’s twist oeuvre would, having seen the trailer, have had reasonable suspicion that Staple’s agenda wouldn’t solely be convincing these patients that they didn’t actually possess the superpowers they believed they did, so the due reveal, the second of three game-changers in the third act, is only really a surprise for the precise nature of what she’s up to, rather than that she’s up to it. She works for a clandestine, strings-pulling group with three-leafed clovers tattooed on their wrists, bent on convincing the world superheroes don’t exist and eradicating all evidence of them where they do. 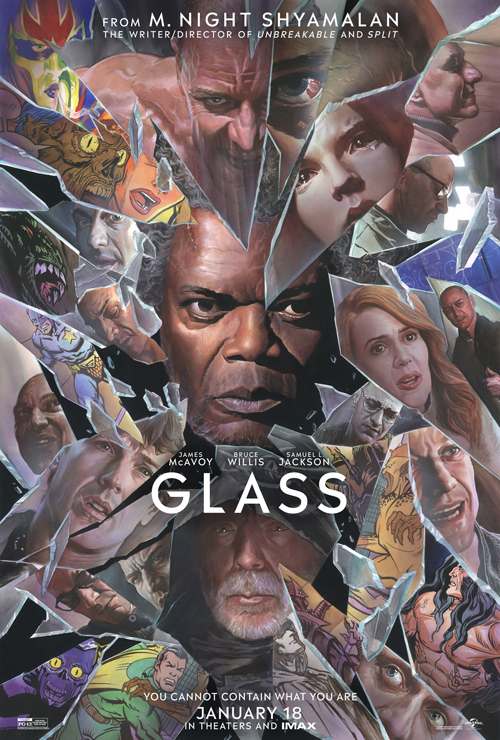 The manner in which Shyamalan makes explicit the tropes and themes of superhero literature during the second and third acts puts anything Unbreakable does in that regard firmly in the shade, since we have not just Samuel L Jackson’s Mr Glass but also Dr Staple, Casey and Joseph Dunn (a returning Spencer Treat Clark – I didn’t even realise he was still acting, albeit in the intervening period I’d only have seen him in Whedon’s Much Ado About Nothing and an episode of Mad Men) extolling or denouncing the impact and authenticity of comic books. The sheer foregrounding at times feels consciously absurdist, except that Shyamalan is dead serious about his theme, thus continuing seamlessly from Unbreakable (although, ironically, even as a relative comic book luddite, it’s clear that in both movies he’s playing fast and loose with their rules and attributes for dramatic effect). And, being a grounded envisioning of the genre, and a low budget – $20m, about a quarter of Unbreakable’s price tag two decades ago, and self-financed by Shyamalan – one at that, Glass must reduce the grandstanding elements and themes to a more pedestrian scale. This is most obviously achieved with the knowing wink of climaxing proceedings in a newly opening tower block (not Nakatomi Plaza) that never comes to pass, and instead settling on a carpark (why not, it worked for Civil War). Thematically, though, Shyamalan effects this by killing off all his supers. Sure, superhero fare does this all the time, only to resurrect them (last year’s biggest movie, please stand up), but there are no end credit extensions on this occasion. On the one hand, it’s an audience-adverse move, although last year’s biggest movie, please stand up. On the other, it’s a move clearly calculated to instil uplift of a different sort, the triumph spelled by revealing superheroes to the world, encouraging the downtrodden masses to have something aspire to and believe in. If that really does make it an origin story, though, Shyamalan is obliged to follow through at some point. It’s this final reveal for me that represents the picture’s stumble, though, rather than structural choices, character fates or meta-content that can be, at times, too on-the-nose and leading. Mr Glass’s big idea, the one that makes him an incomparable genius and Brainiac, is to broadcast undeniable proof of superheroes to Philadelphia (and thus the world); this is why his chosen climax is much, much bigger than a rooftop brawl atop and exploding skyscraper. Except… why does anyone believe it? More to the point, they believe it because, rather than being consigned to YouTube, the national news has confirmed it; but how did it end up there? Evidently, the media is much more robust, independent and immune to fake news in the Shyamalan-verse. Ultimately, I don’t believe that everyone believes it, and I don’t believe that, if they hadn’t been able to spike the programme in the first place, the Three Clovers couldn’t put out a counter story that wouldn’t have the majority of people, those who didn’t want their world rocked, going on about the business on being assured it was an elaborate hoax. One can’t help but feel – not withstanding that it unaccountably appears to have worked – that Elijah’s genius belongs to another era, perhaps one where people believed anything they saw on TV, around and about the Golden Age of Comic Books, maybe (or maybe he just isn’t that smart; after all, his thesis on comic books being documentaries is batshit crazy by any universe’s standards). With regard to the other “twist”, that of the fate of Kevin’s father, the only surprise would have been if Shyamalan hadn’t gone that route, it having been pretty roundly discussed and agreed in the wake of Split and how the Unbreakable world would converge with it. As to the return of these characters? Jackson’s having lots of fun as Price, and clearly relishes the role, even when he’s spending most of his opening scenes doing little but twitching. It’s a big part, but also a “proper” acting one; so much of what he does these days, Tarantino-aside, comes from casting “Sam Jackson” rather than giving him something to sink his teeth into. Plus, Elijah Price has some good beats throughout that justify his notional smarts, from manipulating the workings of the facility to appealing to the Beast as a champion of the downtrodden, until it’s revealed that he trod down another, one who reserves the Beast’s first allegiance. Bruce Willis, I was understandably trepidatious about, since he only cares these days if he’s working with Wes Anderson (maybe Motherless Brooklyn will be another). The additional problem is that David Dunn is such a subdued character anyway, you’re unlikely to notice even if he is trying. So, I thought he was solid, in as much as he effectively services a largely reactive role. Actually, his early scenes with Joseph are really good, economically establishing their father-son crimefighting partnership and their current status as a family (a shame about M Night needing to over-do his cameo in the middle of it). And there’s a good play for embedding the iconic stature of his alter ego, albeit this is mostly established by Kevin’s personalities’ response to an equal; it’s actually fairly believable that both David and Joseph might doubt his abilities after all this time, because, as Glass notes, what kind of threat has he really had to contend with? As for drowning Bruce in a puddle, it isn’t exactly a career apogee; indeed, it might be seen as a meta-commentary of sorts. If anything, the first act of Glass plays out exactly as you’d probably expect of the advertised sequel to Unbreakable/ Split, and very satisfyingly in those terms. The second slips into a slow, talky space that I found equally enjoyable in its own way – I can see why some might have mentally checked out at this point, but I found the interactions and thematic explorations engrossing – and much more in line with Unbreakable’s earnest discourse. The third is probably the least successful, but deserves credit it for what it was trying; it nearlypulls it off, and it’s definitely the better for it than playing it safe and opting for something more standardised. There are nice touches too, such as the way the surviving parties to the superhero trio became friends without any “lineal” animosity between them (effectively a “generational” proof of the “enemy of my enemy” observation); and since I haven’t mentioned her, Charlayne Woodard’s performance as Elijah’s mother in two different time frames merits particular praise (as do the makeup people for subtly effective work). Most appear to be pronouncing Glass the dud of the trilogy, but I’d argue it’s easily the most interesting entry; if it lacks the consistency of tone that made Unbreakable so indelible (and occasionally a little risible), it also sidesteps the unpleasantness that characterised parts of Split. The result is Shyamalan at his most wilfully idiosyncratic, commendably charting his own course when, given the opprobrium of recent years, he might easily have ducked and run. If Glass doesn’t entirely pay off, it couldn’t be accused of resting on its laurels.